Ajuga Bugleweed Ajuga Reptans is native to Europe, western Asia and Iran. 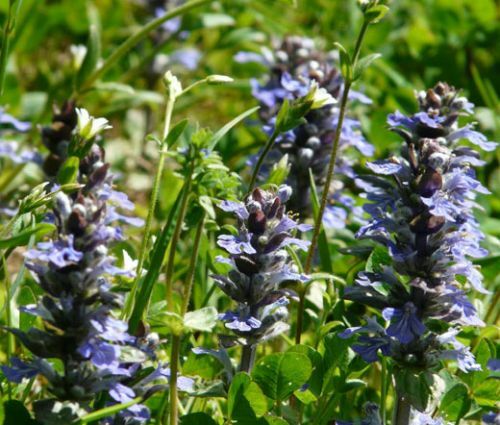 So callled Carpet Bugleweed is a low growing, evergreen perennial plant that forms a dense, mat-like ground cover. 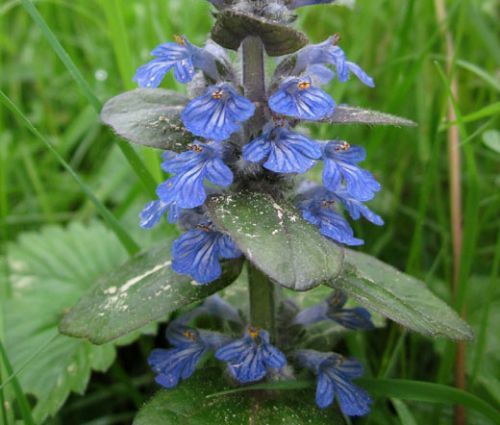 Bugleweed ground cover seeds grow so dense that weeds have almost no chance of germinating. Bugleweed has typical mint flowers that are tubular with two unequal lips and features foliage has basal oblong or spoon shaped leaves which are dark green in color, but during the wintertime, the leaves develop rich bronze and burgundy tones. Because of its flower spikes and unique foliage, Ajuga add color and texture to the shade garden. In the mild winter zones, Bugleweed is an evergreen ground cover plant, and it can also be a great addition to containers for all year around display. Ajuga is a showy ground cover in moist, shady areas of the landscape, and it grows well in areas too shady for grass spreading rapidly by runners. Ajuga Reptans thrives in partial shade and moist soil with good drainage and grows rapidly even in poor, heavy soils tolerating moderately dry areas.